Forming up the biggest Korea Pavilion in history, Korea Halal Export Association(KOHEA) participates in the 15th Malaysia International Halal Showcase(MIHAS 2018), from April 4th (Wed.) to 7th (Sat. 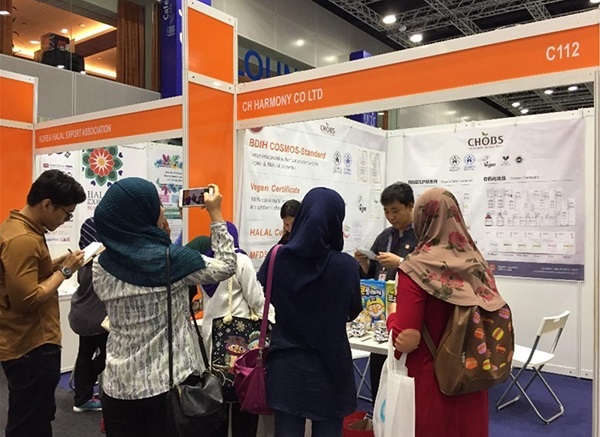 ), 2018 at the Malaysia International Trade and Exhibition Centre, Kuala Lumpur, Malaysia. MIHAS 2018 is the largest Halal product fair in the world organized by Malaysia External Trade Development Corporation(MATRADE). It marks the 15th anniversary of its start in 2004, and also features businesses from major Muslim countries around the world, as well as non-Islamic countries such as Korea, Japan and China, to stage a fierce product promotion. MIHAS 2018 has 34 booths representing 31 companies, significantly expanding the size compared to 6 booths representing 6 companies last year, and also exhibiting a variety of food and cosmetic products, along with health supplements, lactobacillus, flavor, bedding, sanitary pads, etc. Also, KOHEA hosts the 5th Halal Trade Expo Korea, the only Halal trade expo in Korea, on August, 2018 at COEX, Seoul, Korea, drawing many people’s attention. Cosmetics – CH Harmony, Daeduck Lab Co.